Langite is a rare hydrated copper sulfate mineral, with hydroxyl, found almost exclusively in druses of small crystals. 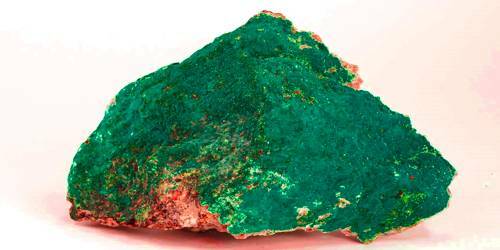 It is a mineral [Cu4(SO4)(OH)6·2H2O] composed of a basic hydrous sulfate of copper. It is formed from the oxidation of copper sulfides and was first described in specimens from Cornwall, England. It is dimorphous with wroewolfeite. It is a secondary mineral dimorphous with wroewolfeite and typically found within oxidized copper-bearing veinstone within mine dumps and underground as flowstone on mine walls. Langite was discovered in 1864 and named after the physicist and crystallographer Viktor von Lang (1838–1921), who was Professor of Physics at the University of Vienna, Austria. 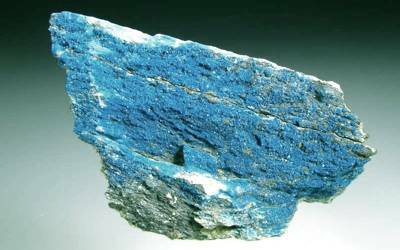 Langite usually occurs as druses of small greenish-blue crystals which may be scaly or earthy. It is translucent, with a vitreous to a silky lustre and a blue-green streak. The mineral is soft, with hardness 2.5 to 3, a little less than that of calcite. Fracture is uneven, and specific gravity is in the range of 3.28 to 3.50, a little less than that of a diamond. Langite is an uncommon but widespread secondary mineral in the oxidized zone of copper sulfide deposits, which may be of a post-mine formation. There are two type localities for langite, Fowey Consols, Tywardreath, Par Area, St Austell District, and St Just, St Just District, both in Cornwall, England. It is associated with wroewolfeite, posnjakite, serpierite, devilline, chalcophyllite, connellite, brochantite, malachite and gypsum. With serpierite coating the bed of a watercourse affected by acid mine drainage at the Lloyd Copper Mine at Burraga, New South Wales, Australia. Intergrown with ktenasite forming fibrous and botryoidal crusts and coatings less than 0.1 mm thick, at the Kintore Open Cut, Broken Hill, New South Wales, Australia.